As of 2015, 64 percent of the population now has internet access. That’s a huge leap from where it was just a few years ago – 19 percent in 2009. The market is saturated. We’re past the point of extreme growth and people think they can get whatever they want online. They’re making decisions about companies completely online. For example, Brafton gets a lot of messages from prospects who just want to know our pricing. They don’t want to get on the phone with someone to hear how our pricing and services work. They want the information they need to make a decision on their own. You might do something similar when deciding where to go out and eat. Before I go to a new restaurant, I do a quick search to look over the menu, see if there are things I like, check the prices, hours of operation, etc. If this information isn’t available for a restaurant on its website, social channels or a review site, I look at other options that do provide a better idea of what I can expect from the experience. This is the new purchase process. People have grown accustomed to having all the information they need at their finger tips. If you’re not there with helpful brand content across their buyer journey, you’re going to lose prospective customers to a competitor that IS there with the right answers. Smartphone use is growing, and there’s now more traffic coming from mobile devices than desktops. Now that most consumers have internet access, they’re investing in devices that keep them connected all the time, no matter where they are. Because people are searching for information on smaller screens, businesses need to adjust their website designs to accommodate mobile devices. How does it look on a tablet or smartphone that’s built for portrait viewing? If you can’t answer these questions, you need to do some research using Google’s mobile-friendly tools. These will tell you if the page looks good on smartphones or tablets, and can help you diagnose opportunities to improve the experience for mobile-first searchers. As people shift to mobile, you need very easy to use ‘Buy’ buttons on your site that are optimized for these devices. It’s also a good idea to add click-to-call options on your site. Once they make a purchase decision, they want to be able to act on it. 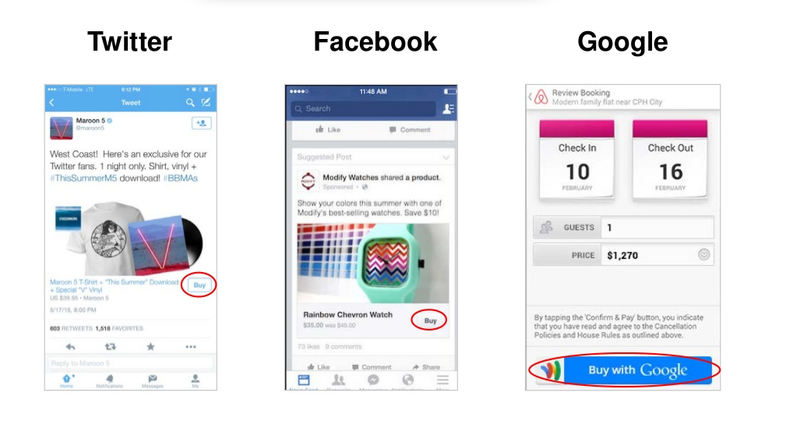 If you want some good examples of ‘Buy’ buttons on mobile, look at social ads. Social has always been ahead of the curve with super simple buy buttons that help advertisers track direct value from their promoted content. Speaking of social, video is huge. There are 4 billion video views on Facebook every day, so it’s clearly a good outlet for distributing video content … if it fits in with everything else that’s on the network. There are 4 billion video views on Facebook every day. Before you build a video marketing campaign for Facebook, or any other social network, think about your audience’s expectations. Most Facebook users are just there browsing for entertaining content – browsing being the operative word. Although Facebook shares for video has increased 43 percent in the past year, most people only watch three seconds of a video before they move on. Will viewers get value out of your video within three seconds? If not, you might want to adjust your content strategy to match viewers’ expectations for the channel. If you want to capitalize on Facebook’s video boom, I’d advice creating short, funny clips. Keep it entertaining and don’t be too promotional. For an in-depth guide to creating video content for marketing campaigns, check out this free eBook that covers 7 Common mistakes & how to avoid them. Analytics used to be arduous. You had to be really good with Google Analytics and find the information you needed piecemeal, then put it into a spreadsheet and then figure out what it meant for each part of your strategy. But the demand for marketing technology is growing and more companies are putting all the marketing insights you need in one place, in a visual format that’s easy to understand and use. Companies that are most successful with content marketing create a documented strategy, and use marketing technology tools to track their progress. They can easily identify what’s working, and where there are prime opportunities for improvement if they increased their focus on a core key term to grab additional visibility, changed their approach to creating headlines or increased their use of graphics on social media. Meanwhile, 20 percent of companies miss key opportunities when they don’t invest in the marketing technology they need to make agile decisions. 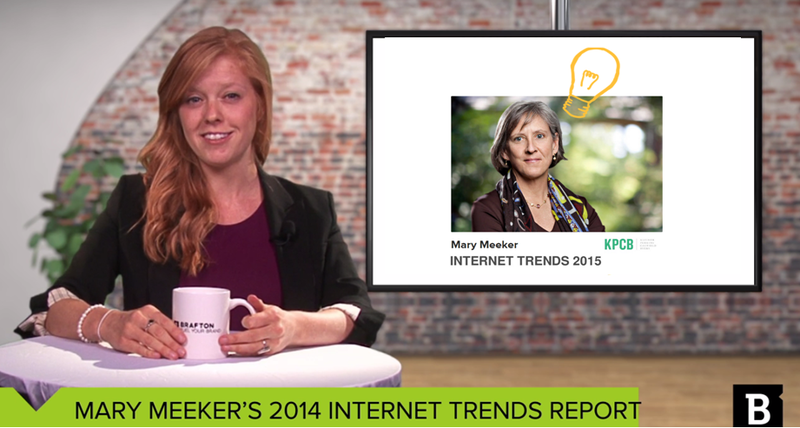 There’s your roundup of the top five content marketing takeaways from Mary Meeker’s 2015 Internet Trends report. Let us know if you have any questions in the comments section below, or by Tweeting @Brafton.